Believe it or not, the health and fitness industry is beginning to recognize yoga as much more than just an esoteric set of stretches. In fact, yoga is now considered one of the best ways to get strong while also increasing flexibility. A solid yoga practice will address every muscle group, but two of the benefits of yoga are the improvement of core strength and stability. Living a pain-free, active lifestyle starts from our center. The core is not just the abdominals — the “six pack” — instead, it is a complex weave of muscles that connect the upper and lower body. When people think about getting a strong midsection, often times they imagine lying on their back and doing crunches, bicycles, leg lifts, etc. Those help strengthen the core, but the cool thing about standing core-strength poses is they not only strengthen the core, they also strengthen the lower body. In doing so, they create a synergy between the core and lower body that is much more functional than exercises that isolate just one area of the body (like crunches). Although this pose is often overlooked as a strength builder in yoga, it is one of the most important. While folded over reaching for your toes, you’re not just hanging there like a rag doll — you are attempting to take the hunch out of your back using your abdominals. Place your fingertips on the floor directly underneath your shoulders or press your hands into your shins and try to imagine the entire length of your spine extending out as you flatten your back. Don’t forget to breathe deeply while you stretch! For this pose, many yoga teachers will say things like “flatten your back” or “come to your fingertips and glance forward,” but those are simply tools to help guide you to the main purpose of the pose — to lengthen your spine. This classic yoga pose is a great way to strengthen your sides. The obliques are an important muscle group that wrap along the sides of your waist and help provide torso stability. Be sure to use your legs to support most of the body weight in this pose. The bottom arm should be light on your front leg or on the ground so the obliques and quadratus lumborum (another important postural muscle group located on both sides of the spine) can grow stronger. The ultimate back strengthening pose. I love chair pose because it awakens the muscles supporting the spinal column and helps to get that backside strong! A six-pack by itself isn’t healthy unless the buttocks muscles are just as strong. This pose is also a great way to strengthen the legs. Just make sure not to strain your neck as you reach up and lengthen the spine. This pose takes more than just good balance. Balancing on one leg demands core engagement. While in this pose, it is of utmost importance to lengthen the spine and core muscles are critical to this. It’s good to remember that in this pose, you shouldn’t completely lock the standing leg and you should keep your lower abdomen drawn and up to support the lower back. This pose has many of the same setup as Warrior 3 but adds a twist that engages the deeper abdominal muscles. This spinal twist fires up all the muscles in the core. That said, this is an intermediate-level pose and it is helpful for many people to put a block on the ground next to your front foot. With your hand on the block, take a deep breath and elongate the spine, then slowly twist, reaching your top hand toward the ceiling. If you are new to yoga, check out Beachbody’s yoga program, 3 Week Yoga Retreat, where I, along with three other yoga experts, will guide you through the foundations of yoga. 5 things you might not know about levels of toxins in your body. You will know if toxins are overflowing in your body if you experience things like frequent headaches, joint aches, bloating, digestive discomfort, diarrhea or constipation, multiple chemical of food sensitivities, rashes, irritability, fatigue, repeated injury, brain fog, or troubles concentrating. about levels of toxins in your body. Your body is constantly in a detox mode. Your skin, lungs, kidneys, bowels, liver, and ability to self regulate emotions all contribute to detoxification. A baby born today has over 50-200 recognized toxins in their blood stream? Reports from Scientific American and University of Toronto. Drinking Alcohol adds to your toxic load. So could the pesticides on your food, the cosmetics you might use, renovations in home or office, cooking and freezing food in plastics, your daily commute, and the emotional stressors in your life. You can measure your levels of toxins with hair, urine and blood analysis. A naturopathic doctor can help you prioritize your actions and boost your body’s ability to naturally detoxify. Download your Toxic Questionnaire here. If you’ve ever worn your workout clothes for something other than working out — raise your hand if you’ve worn yoga pants to brunch! — you probably know a thing or two about athleisure. In fact, athleisure, or “casual clothing designed to be worn both for exercising and for general use,” is so popular that the term is now officially in the dictionary. But before you slip on that freshly laundered workout top to run errands, you may want to do a smell test. Your workout clothes endure more wear and tear (and sweat) than your regular clothes, so if you’re not taking care of them correctly, the aroma from last week’s plyo workout may linger, even after a wash cycle. Read on for practical tips on how to get the funk out of your workout clothes. Most athletic apparel is marketed to keep us “drier, cooler, and more comfortable” while we get our sweat on. But clothes can get in the way of the body’s natural ability to keep us cool via sweating, which is why a lot of workout gear is designed specifically to absorb moisture. For clothing labeled “moisture-wicking,” the idea is that the fabric will pull sweat away from your skin and through the clothing surface so it can evaporate and keep you dry. So does it really work? In a small study that examined the effects of a form-fitted, moisture-wicking shirt, the body temperature of the participants wearing a shirt made of synthetic materials was lower than participants who wore 100-percent cotton shirts. The polyester elastane shirts also retained less sweat during exercise. The researchers suggest that the synthetic fibers’ ability to ventilate and evaporate may help keep you cooler. Because of its ability to absorb moisture, aka sweat, athletic wear is a different beast when it’s time to do laundry. 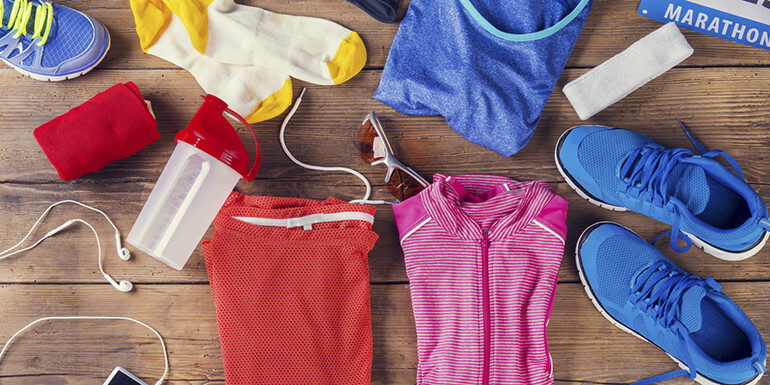 Follow these tips to keep your workout gear fresher, longer. Don’t let your clothes fester: It’s unrealistic to do a load of laundry every time you work out. But also don’t forget about them. Adding damp clothes to the dirty laundry pile will only make them stinkier. Research shows that bacteria grows on sweaty clothes when they sit for an extended period of time. If your clothes are totally soaked through, toss them in the wash immediately. No time to wash? Lay them on a drying rack or hang them to dry before laundry day. Steer clear of fabric softener: Fabric softener not only damages stretchy clothes, but it also leaves behind a film that can hold smells captive. 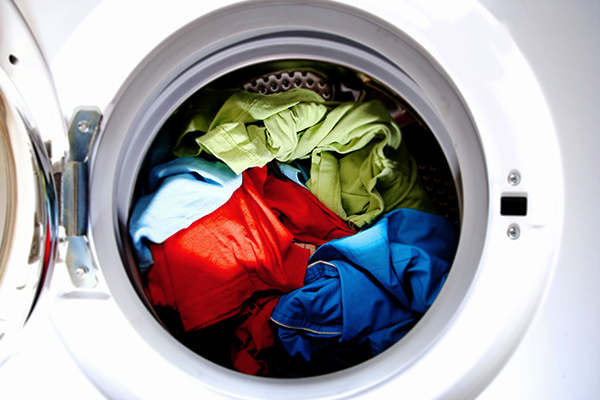 For a natural softener that can stave off stale sweat smells, add half a cup of white vinegar to the wash cycle. Don’t add more detergent: Smellier load calls for more detergent, right? Wrong. Washing machines are designed to use a set amount of detergent based on the size of the load. Excess soap will just build up on your clothes, which will then trap dead skin and harbor fungus. Ick. Raid your kitchen: Lemon juice, baking soda, and vinegar can all reduce unpleasant post-workout smells. Pour a ½ cup of baking soda or squeeze the juice of one large lemon to the rinse cycle. The baking soda neutralizes odors while the citric acid in the juice breaks down the oils in the clothing fibers. If you don’t want to wait around for the rinse cycle, look for detergents that have baking soda added. Or soak your workout clothes in a mixture of white vinegar and cold water for about 15 to 30 minutes before tossing in the washing machine. The vinegar acts as both a natural fabric softener and bacteria killer. Consider natural fabrics: While synthetic fabrics such as polyester and polypropylene once dominated the athletic-wear sector, natural fibers such as cotton, wool and bamboo have found a home in a number of athletic lines. Research indicates that wool garments retain fewer odors than clothing made with polyester, which actually creates more unpleasant smells compared to cotton clothing. Toss it: Keep an eye (and nose) on the state of your workout gear. Chafing spots, stretched straps and waistbands, unsightly holes, and a smell that simply won’t go away are all signs it’s time to get new gear. The lifespan of any piece of workout wear — despite what it’s made of — will vary, depending on how often you use and abuse it and how well you take care of it. The athleisure trend is here to stay (for now, at least! ), so if you want your cute workout/brunch outfit to be on point, just remember to treat it right. When seeking a quality fish oil, please look for one that is 3rd party tested and cleansed of heavy metals. Last thing you wish for is a mercury pill. Fish oil is great for so many things in health and here is one more to keep in mind, or shall I say, at heart. According to a new study just published 3 days ago in the journal Circulation, high dose fish oils post heart attack improved heart function and reduced scarring. After a heart attack, the shape and function of the heart can change, which could end up leading to heart failure. Unfortunately, there are limited things that can improve healing of the heart or prevent adverse remodeling. This new study demonstrates the significant role of omega-3 fatty acids in supporting the structure and tissue of the heart. The study included 360 heart attack survivors. Researchers compared patients taking 4 grams of omega-3 fatty acids daily for six months to those taking a placebo. There was a 5.8% reduction in left ventricular end-systolic volume index (predicts patient outcome) and a 5.6% reduction in fibrosis formation in the non-damaged heart muscle of the fish oil group. The treatment was safe and effective. Both groups received treatment based on guidelines issued by the American College of Cardiology Foundation and the American Heart Association. Blood tests were used to confirm that patients in the omega-3 fatty acids group were compliant to the treatment. This study is significant, since heart failure is a major problem post heart attack. The results demonstrate that omega-3 fatty acids help to improve cardiac remodeling, which allows the heart to contract better and decreases fibrosis in the region that is not damaged. Fish oil supplementation is essential for cardiovascular health. Some doctors recommend fish oils to improve LDL particle size and lower triglycerides, as well as for their anti-inflammatory properties and simply for their support of overall health, since these fats are essential for the normal function of all of our cells. Patients with heart failure are individuals who have a disruption in their metabolic processes, and as the heart muscle weakens it cannot meet metabolic demands. Thus, additional nutrients are also essential for these individuals, including the energy-supportive nutrients ribose, CoQ10, and l-carnitine. Ribose is a key nutrient for quickly restoring cardiac energy stores. It is needed to synthesize adenine nucleotides, certain vitamins, and other important cellular compounds. CoQ10 plays a central role in the production of ATP and is required for muscle contraction and other cellular processes. Carnitine supports the heart by the delivery of fat to the heart muscle, which is its main fuel source. In addition, magnesium and potassium should be considered to support all cardiovascular conditions. These nutrients are often depleted in heart failure, most commonly by the use of diuretic medications. Shared by Dr. Laura M. Brown, ND.